The Lakes collection is an exquisite range of very high quality and high security virtually maintenance free GRP fiberglass doors with a superior range of decorative glass. They are extremely strong, robust and UV stable, the doors will not dent, warp, crack or twist you can have the look of a traditional timber door without all the defects. The door slab carries a 25-year warranty, the door set for 10 years and 10 years against UV fading. Experienced craftsmen, working to the highest standards, have used the best materials and the most advanced production methods to create a range of stylish and durable doors, fitted with advanced security locking. Our beautiful range of doors are available in white, wood grain, rosewood, light oak and two-tone (white on the inside, a different finish out). Bi-folding doors to be used instead of patio and French doors. They can also be used in conjunction with a conservatory to bring the outdoors in and to enjoy the benefits of alfresco eating. Bi-folding doors are available in both uPVC and Aluminium. A canopy or porch can provide protection and shelter from the weather as well as create a decorative feature that draws the eye to the main entrance of the house. Your uPVC Porch can be inside the main front wall or protrude from the building. 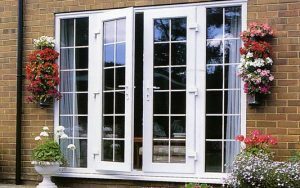 Styles range from enclosed stone or brick porches to open timbered frame that might be part glazed. The 18th and 19th century builders used simple roof canopies or door hoods and later in the 19th century saw timber painted lattice work porches become popular. Making Some Improvements to your house? What Type of Replacement Gas Boiler do I need?